You are here: Home » MEDIA » Books » Beautiful Blood by Lucius Shepard (book review). 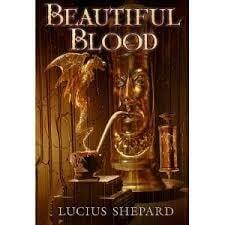 Beautiful Blood by Lucius Shepard (book review). ‘Beautiful Blood’ is the first novel-length story featuring the dragon Griaule, a recurring ‘character’ who has appeared in a number of Lucius Shepard’s short stories. Griaule lies dormant on the hillside above the city of Teocinte, where dragon worshippers abound and whole towns have sprung up on the dragon’s back. Richard Rosacher thinks the dragon is nothing more than an over-sized lizard yet, in his studies of Griaule’s blood, he discovers something that could make him wealthy beyond belief. Exploiting his findings, Rosacher grows in wealth and power, but at the cost of years of his life that disappear in the blink of an eye. As Rosacher watches his friends grow old and his wealth increase, he wonders whether the price has been too high. Yet he’s also gained something he could never have imagined. Lucius Shepard writes with beautiful descriptions, showcasing characters that are at times likeable, at times detestable but always very human. ‘Beautiful Blood’ is a story about a man who gains wealth and power through drug distribution and manipulation. It’s also about humanity, wonder, faith and morality told in a way that’s both magical and very grounded in reality. I picked it up because I love dragons, but this is a story that’s only incidentally about a dragon. Mostly, the dragon just lies there and provides a setting, a geographical feature rather than being an active character. Rosacher is a character that carries the story through really well. He’s immensely flawed but also idealistic at heart. The time he loses allow us to look back on decisions he’s made and how things have changed over quite a long time period. There are a lot of ‘what if…?’ questions that we’re encouraged to think about. What if he’d spent his time starting a family? What if he had continued to study the dragon’s blood? What if the drug had unexpected side effects? What if the cost was too high? There are lots of things to think about, but above all this is a good story. It’s got romance, adventure, crime, corruption, magic and a dash of cynicism. If it comes with added layers that encourage you to question things further then that’s an added bonus. Shepard has created a brilliant world, populated it with good characters and constructed a story that allows you to explore all this from the comfort of your sofa. What more could you ask for? Yes we did. It was mentioned in a review of one of his other books a few months back. « Soldier (1998) (DVD film review).